God created the moon. The moon belongs to God. Is there anything made by God that is made in vain? I think NOT! Just as the insect and the seasons have purpose, so the moon has her divine resonance. Today is the second day beneath the first quarter moon, or half moon. It is very cloudy out so we will have a difficult time seeing her in Chicago, but her presence is definitely felt, especially if you CHOOSE to feel her. This phase of the moon is often underplayed or overlooked, but truly each phase is of equal significance and rolls into the next like a divine wheel. As for meaning, you ask? The half moon is a GREAT time to give mind to the future. Now that you have set your intentions during the New Moon, what are your long term/short term goals as you move forward? The only constant in life is change and the moon is a celestial wheel of change that our ancient Ancestors paid attention to. The work requires that we turn ourselves towards fulfillment, pay close attention to the incoming tide of possibilities that present themselves, meditate on them, pray over your choice-making and be diligent in making bold, confident, spirit-led decisions in your life. A Sacred Space: A good place to begin your moon phase ritual will be quiet, uncluttered, and will feel positive and peaceful. If you already have a prayer alter, this is the BEST place. You need a writing surface ( or your lap will suffice), paper that you love, and your favorite pen or markers. 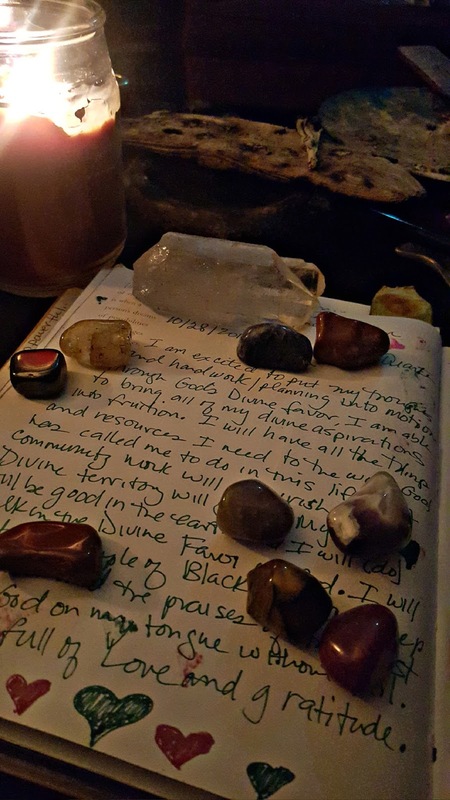 Because this is a ritual, make sure everything you use is something you find pleasing. Light a candle. Diffuse essential oils. Add crystals or anything else that feels good to you (see photo). 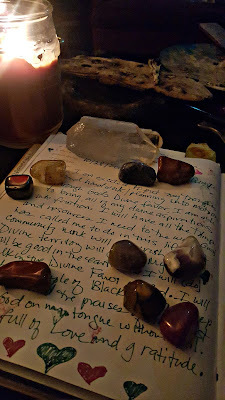 It's a good ritualistic practice to place a quartz and other crystals on the paper to increase the energetic vibration as we channel manifestation...especially freshly charged ones. Symbols are a form of universal communication so draw a symbol such as a heart, Adinkra, star, or anything else that has meaning to you.